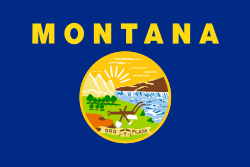 This is a list of law enforcement agencies in the state of Montana. According to the US Bureau of Justice Statistics' 2008 Census of State and Local Law Enforcement Agencies, the state had 119 law enforcement agencies employing 3,229 sworn police officers, about 201 for each 100,000 residents. ^ "Census of State and Local Law Enforcement Agencies, 2008" (PDF). ^ Strickland, Megan (27 November 2015). "Duck hunter pleads not guilty to shooting at other hunters". Daily Interlake. Retrieved 28 November 2015. This page was last edited on 26 January 2018, at 21:43 (UTC).